The following revue of this book appeared in the Ipoh Echo on September 16th 2011. The book was launched to a large audience of public and press, by Tun Lim Keng Yaik, in the Royal Ipoh Club, the following day. "Penned by 47 different authors, all of whom spent some or all of their childhood days in Ipoh, this is a book like none other. Here they share their memories of their beloved “Home Town”, good and bad, which together provide a rich tapestry of sights and sounds of days gone by. The writers have reminisced about growing up in Ipoh, in 64 different, heart-warming and absorbing tales, the earliest from a young man born on Market Street in 1920 and the youngest just turned 13. The stories range across a wide spectrum of subjects - from food to fashion, geese to girlfriends, opium to opera, schools to squalor, toilets to Towkays and rubber seeds to rocking horses. 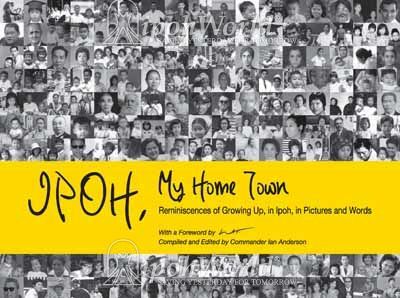 Indeed the book seems to cover every aspect of what growing up in Ipoh was all about and how life changed as the years rolled by. The list of authors, many of whom live overseas, is also impressive for there are representatives from all the major races of Peninsula Malaysia, plus a couple of Europeans and even an Iban, born in Ipoh. Truly “Bangsa Malaysia”, they come from all walks of life, Captain Ho Weng Toh, a “Flying Tiger”, Professor Wang Gungwu, a Greentown boy before the war, Malaysia’s most famous ‘Kampung Boy’ Lat (who has also written the Foreword), a famous Towkay’s daughter, well-known representatives from stage, screen and radio and successful businessmen and women, housewives and mothers, but no politicians. Obviously a book like this needs an editor and compiler and here is another surprise for no one would guess that this exceptional book is the work of an expatriate, Commander Ian Anderson, who has adopted Ipoh as his “Home Town”. But then again, Anderson is an exceptional person who plays a greater part in Ipoh than many locals. He is the man behind www.ipohworld.org, Tenby Schools Ipoh’s history project. He is clearly dedicated to Ipoh and its history, as this book demonstrates. But this is not just a collection of stories for each one is backed up by photographs, many never seen before. Around 450 in all and there is an added bonus for Lat’s own story which has original cartoons to illustrate his piece. Hard bound, with 276 pages, beautifully laid out with tasteful pastel colours that enhance the overall feeling of enjoyment, the book sells in all the normal outlets for the surprisingly economical price of RM100. Worthy of a price tag significantly higher, the publisher has set this on a “Non Profit” basis in the hope that this will allow more people to enjoy this unique venture. I thoroughly recommend this book as an important and significant work, a book for all ages, even if you do not come from Ipoh. It is for those who have already grown up and love to look back to their happy days when a cardboard box, home-made toys, a few rubber seeds or a matchbox and a spider could become the nucleus in the making of a champion. But it is also for those who are still growing up to find out that walking an hour to school and back was quite normal, 5-cents pocket money was enough to survive on and girls were just for looking at. Published by Media Masters Publishing Sdn Bhd, based in Ipoh. Available at major bookstores, online at www.ipohworld.org and Ipoh Echo. Tel: 05-2495938 or e-mail: info@mediamasters.com.my."